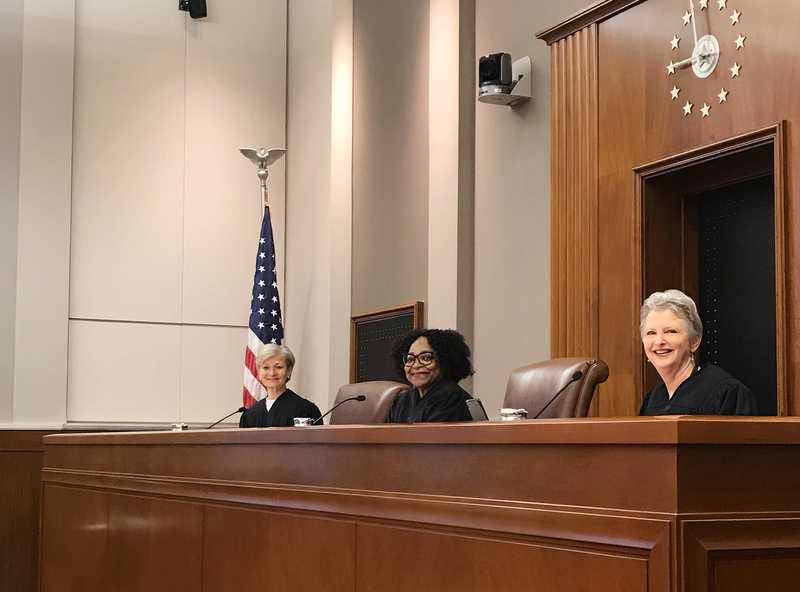 As befitting International Women’s Day, an all-women appellate panel of the United States Court of Appeals for the Ninth Circuit heard oral arguments Thursday (March 8, 2018) at the William K. Nakamura U.S. Courthouse in Seattle. The panel consisted of Ninth Circuit Judges Johnnie B. Rawlinson of Las Vegas and Morgan Christen of Anchorage, Alaska, and, sitting by designation, Chief District Judge Nancy D. Freudenthal of the U.S. District Court for the District of Wyoming. As all-women panels occur infrequently, the court’s Seattle calendar was unusual in that another all-women panel heard cases the day before. Judges Rawlinson and Christen and, sitting by designation, District Judge Cathy A. Bencivengo of the U.S. District Court for the Southern District of California comprised that panel. The Ninth Circuit bench includes 23 active judges, 11 of whom are women, and 17 senior judges, two of whom are women.